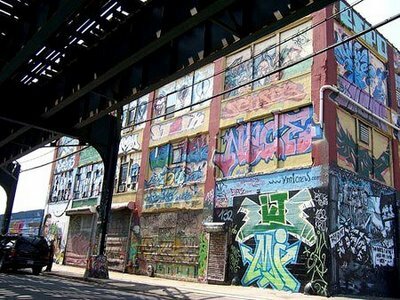 New York and Detroit are both encountering the difficulty which arises when street art achieves recognition. In Detroit, a group removed a Banksy work from near an abandoned Packard plant. The 555 Non-profit gallery which cut away the wall is now engaged in a legal dispute with the owner of the Packard site over the mural. The dispute brings to mind so many interesting questions. Banksy may have intend his mural to be temporary, and only seen for a limited time in the context of the decaying auto plant. Did the gallery strip the mural of its context by removing it? How is that removal much different than the stripping of pre-Columbian stelae from central and south America? The techniques of sawing are probably similar, and we are left with a decontextualized panel in a different space, left to imagine what the work would have looked like in its original, though perhaps threatened, context. But now that space is being re-purposed by the owner of the building. The warehouse itself may be in need of serious repair anyway, as an external staircase collapsed in 2009. As the owner of the building, Jerry Wolkoff would ordinarily be free to do what he wishes with his building. Yet the artists are upset that their creative space is disappearing and may seek to have the building declared a historical landmark. Will the re-purposed developoment continue to serve the same function of bringing together artists? Surely not. And part of the excitement of the street art scene was its newness and how it emerged as a new art form breaking free of conventions. Yet wider appreciation for street art, and the commodification of these works, are slowly imposing the conventions anyway. Matthew Dolan, If You Take Street Art Off the Street, Is It Still Art?, wsj.com, March 9, 2011, http://online.wsj.com/article/SB10001424052748704071304576160544164062176.html#articleTabs%3Darticle (last visited Mar 9, 2011). Marlon Bishop, Queens Graffiti Mecca Faces Redevelopment, WNYC, , http://culture.wnyc.org/articles/features/2011/mar/07/queens-graffiti-mecca-faces-redevelopment/ (last visited Mar 9, 2011).